Contractors will also fill the Battery Street Tunnel with viaduct rubble, regrade lower Aurora Avenue North and build east-west Aurora crossings at Thomas and John streets. A contractor has been chosen to demolish the old Alaskan Way Viaduct, which is fast approaching its annihilation. Kiewit Infrastructure West submitted the winning bid at $93.7 million, the Washington State Department of Transportation (WSDOT) announced Tuesday. 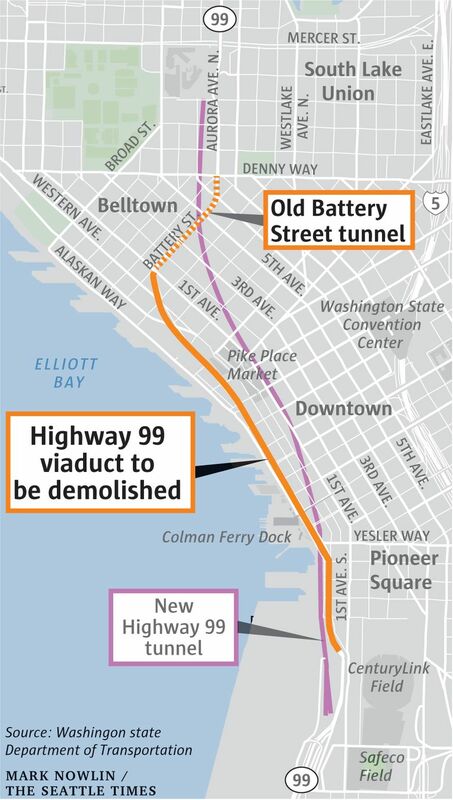 “It will be challenging to tear down a major highway in the heart of a booming city, but we’re looking forward to getting it done safely and as quickly as possible,” said WSDOT program administrator Brian Nielsen. Contractors will also fill the Battery Street Tunnel with viaduct rubble or other fill, and must apply low-density concrete near the top, to support the abandoned tunnel walls and beams. They will regrade lower Aurora Avenue North as an urban boulevard, and build east-west crossings of Aurora at Thomas and John streets, next to a Harrison Street connection already prepared. Demolition crews must cut and break apart brittle concrete within 25 feet of tech offices, a homeless-service center, historic brick buildings and a new apartment tower. Screens or curtains are required, as are methods to limit ground vibrations. The state wouldn’t release technical details until a final contract is signed and more engineering is done. Kiewit’s bid price is above WSDOT’s $83 million engineer’s estimate and within the agency’s planning range of $80 million to $100 million, spokeswoman Laura Newborn said. 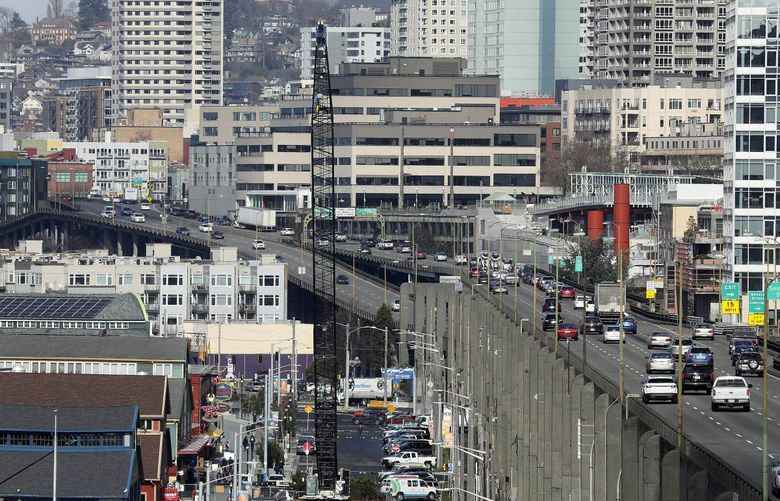 The viaduct will close permanently this fall, about three weeks before the new Highway 99 tunnel opens, bypassing downtown between Sodo and South Lake Union. During those weeks, surface ramps will be connected to the tunnel. Major demolition would occur from January and last several months. Before that, the southbound onramp above Columbia Street will be removed, so the city of Seattle can complete a two-way hillside street for buses. A temporary asphalt layer is already paved for demolition machines and limited two-way traffic on Alaskan Way, south of the ferry terminal — where tunnel-boring machine Bertha was exhumed and repaired in 2015. The viaduct offers a sweeping Puget Sound view for drivers and passengers, and starred in car commercials and sportscasts. The structure was built in 1953 and weakened by a 2001 earthquake. In the decades between, highway officials designed but didn’t build a total encirclement of downtown, in the Bay Freeway proposal. Instead, the future will bring a quieter waterfront for visitors, wider spaces to walk and more congestion while driving to Ballard.